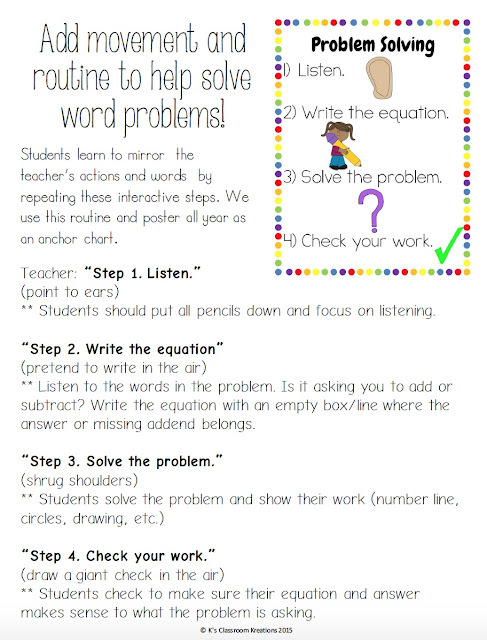 Do your students struggle with word problems? I know mine do! Although many can solve equations, the wording of some problems seems to confuse my first graders. One of the biggest reasons they solve problems incorrectly is because they often rush to find answers. To help combat their desire to "speed solve" I have implemented a Problem Solving Routine. I hope this can help your kiddos too! 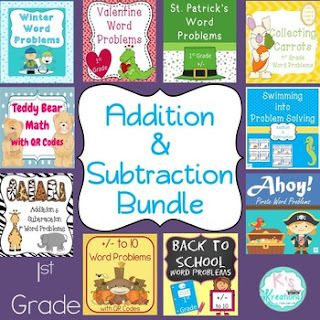 First, it is important to know that there are many different types of addition and subtraction problems. For example, sometimes students are looking for the sum/total unknown (9 + 3 = __). Other times the total is provided but an addend, or part, is missing (9 + ___ = 12). I first teach my students how to solve basic addition and subtraction problems with unknowns in all positions. For more information and games on how I teach these skills you can click here and here. We also do a lot of composing and decomposing of numbers. I find that the most important part of looking at equations is thinking about real life/interesting situations where the numbers could be applied. When we look at the equation 9 + 3 = __ I might use an example like "The Ninja Turtles ordered 9 pepperoni pizzas. Then, they order 3 cheese pizzas. How many pizzas did they have in all?" By creating problems with themes that they enjoy, students, especially those that may be intimidated by math, become more engaged. I also will use a similar problem like "The Ninja Turtles ordered 9 pepperoni pizzas. Then they ordered some cheese pizzas. Altogether they have 12 pizzas. How many of the pizzas were cheese?" We discuss how the problems are the same, but also how they are providing different information and asking two different questions. When students know how to use number bonds and compose/decompose numbers fluently, they are able to plug in the information where it belongs. 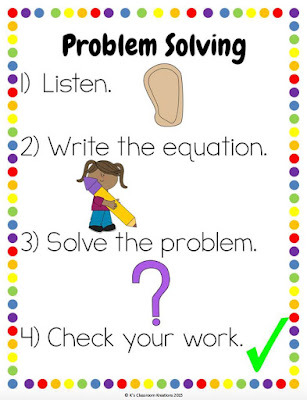 The steps we use for our problem solving routine are below, and can be downloaded for free. I hang this mini poster in my classroom and we refer to it daily. The repeat after me style and hand movements also make it easier to remember. I love creating word problem activities and have several in my store- I use the cards for centers and small groups, open ended problems for independent work, recording sheets for homework, and QR codes as self checkers (not all of my products have them currently but I am working on them). If you need word problem activities here is my bundle (all can be found individually as well). 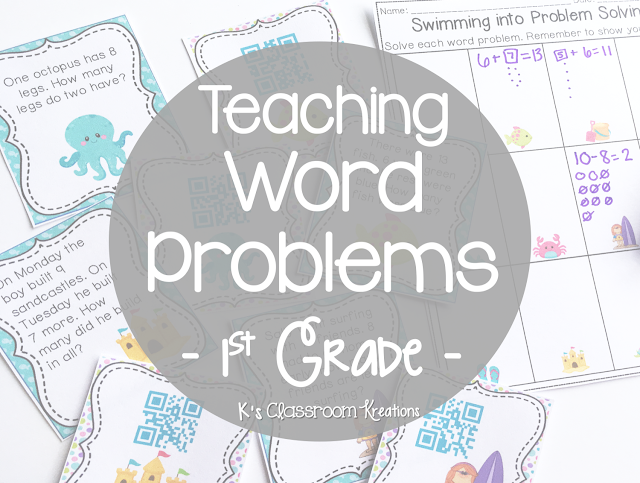 What is your favorite way to teach word problems? I absolutely love thematic math! I talked about it on my blog for Math Tip Monday as well! 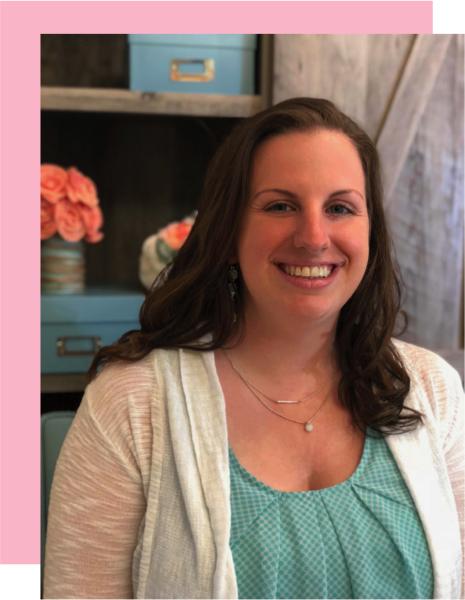 Your poster is really cute and I might have to try it with my kinders! I think it's a great idea to add movement too the problem solving steps. It's more fun, and it helps make more connections in the brain. They might not always remember the steps right away, but they'll remember the movements which can help them figure out the steps. I'm going to have to add this to my problem solving steps!